How do I determine the latitude and longitude of an historic site? To be added to the Historic Sites of Manitoba map, we need the site’s location on the Earth— its latitude and longitude. These values can be obtained, in some cases, using software such as Google Earth. To get an accurate location, especially in rural areas, it may be necessary to visit the site with a Global Positioning System (GPS) receiver which, by triangulating with satellites orbiting the Earth, can determine its location to within a few meters. Nowadays, GPS receivers are relatively inexpensive, precise, easy to use, and available at most home electronics and hardware stores. The best results will be obtained by taking multiple readings at the historic site, and calculating the average latitude and longitude of all readings. More sophisticated GPS receivers have an “averaging” feature that does this calculation automatically. We find that 25 to 50 separate readings will usually give averages within 3 meters of the correct location. If possible, please record and submit latitude and longitude values in decimal degrees with five decimal places (for example, the location of Dalnavert Museum is N49.88587, W97.14218) rather than degrees-minutes-seconds. If you have already recorded values as degrees-minutes-seconds, submit them as such, and we will convert them into decimal degrees. The MHS has a simple-to-use GPS receiver which is available for short-term loan if you would like to participate in this project and do not have your own. Please send email to the MHS Webmaster (webmaster@mhs.mb.ca) to arrange to borrow our GPS receiver. How do I find an historic site, using the latitude and longitude provided by the Historic Sites of Manitoba map? All sites shown on the Historic Sites of Manitoba map provide its latitude and longitude in decimal degrees. For example, the location of Dalnavert Museum is N49.88587, W97.14218. You can enter these coordinates into the Search box of Google Earth software to view the site. To visit an historic site in person, create a waypoint (also called a waymark) in a GPS receiver and use it to navigate to that waypoint. More sophisticated GPS receivers include a base map so it can provide detailed turn-by-turn driving directions along the route. The locations of some historic sites are described by a series of three numbers. What do these numbers mean? The locations of historic sites in rural Manitoba are sometimes described by Section-Township-Range coordinates. An example is a monument for Rockwood School No. 19 which is located at NE17-13-2E. The Section-Township-Range (STR) coordinate system was devised when Western Canada was being surveyed in preparation for the arrival of European settlers in the 1870s. It is mostly used in the southern, agricultural parts of Manitoba, Saskatchewan, Alberta, and British Columbia. Patterned on a similar system used in the United States, the land is divided into a series of Ranges, each six miles wide (East-West) and running from the Canada-US border northward. Ranges are numbered sequentially from 1, relative to a Principal Meridian situated slightly west of Winnipeg. So Ranges situated East of the Principal Meridian are numbered 1E, 2E, 3E and so on, while those west of the Principal Meridian are 1W, 2W, 3W and so on. Ranges are divided into Townships that are six miles tall. Consequently, one Township is six miles wide and six miles tall, or 36 square miles in area. Townships are numbered sequentially starting from the Canada-US border. 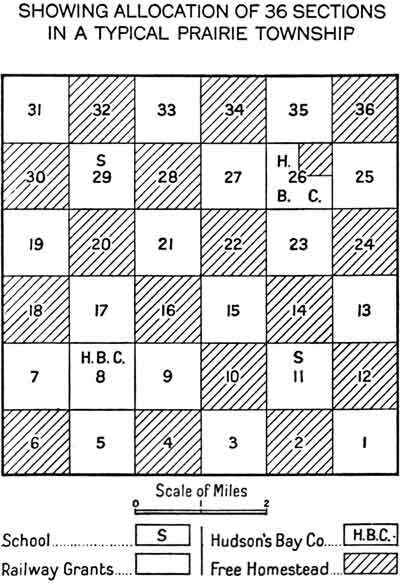 As noted in the above diagram, odd-numbered Sections were given to railway companies (principally the Canadian Pacific Railway but also others) to compensate them for the enormous construction costs of the railways. Sections 11 and 29 were set aside for school purposes, and Sections 8 and three-quarters of Section 26 were given to the Hudson’s Bay Company to compensate it for the extinction of its original land grant. The remaining even-numbered Sections were made available as free homesteads for those willing to live and develop farms on them. Each Section was subdivided into quarters, denoted Northeast, Southeast, Southwest, and Northwest. Each quarter is one-quarter of a square mile in area, or 160 acres. So the Rockwood School No. 19 monument mentioned above, located at NE17-13-2E, can be found in the northeast quarter of Section 17 in Township 13 of Range 2, East of the Principal Meridian. Roads allowances 99 feet wide were established between adjoining Sections to provide access to them. In many cases, roads were actually constructed although not always improved to modern standards. Many are rudimentary, with no gravel or pavement. Some road allowances have been abandoned, or roads were never constructed on them. How do I find other historic sites near a particular site? Scroll to the bottom of any page describing a particular historic site and click the link labeled “Map of all sites” to go to the main map. Use it to go to a particular part of Manitoba to view the historic sites in that area. How can I correct an error in the location or description of a site shown on the Historic Sites of Manitoba map? Please send email to the MHS Webmaster (webmaster@mhs.mb.ca) describing the nature of the error and the correct information. You will usually receive a reply within 2 to 3 business days. Are all sites shown on the Historic Sites of Manitoba map accessible to the public? Virtually all sites on the Historic Sites of Manitoba map are viewable from public property. Some historic sites (such as some former public school buildings) are situated on private property. As such, they are not accessible to the public without permission of their owner. Always request permission before going onto private property to view an historic site. Some historic sites are situated in remote locations, accessible only by roads with no pavement or gravel. Caution should be exercised when trying to visit such sites, especially following wet weather when roadways may be impassable. Who created the Historic Sites of Manitoba map? The Historic Sites of Manitoba map is a project of the Manitoba Historical Society, supervised by the MHS Webmaster with assistance from many people. See the Acknowledgements for a partial list of those who have helped to develop this map. If you have a question that is not addressed above, please send email to the MHS Webmaster (webmaster@mhs.mb.ca).